Sewing machine. Beg, borrow, or buy one so that you will have the ability to practice your sewing skills at home. However, if you don't have access to one, we have some extras you may borrow on a first come/first served basis. Ask neighbors, aunts, grandmothers if they own a machine - you may be surprised who has one sitting unused in their closet! Please make sure your machine is in working order. (Last year we spent too much time trying to repair machines and consoling frustrated campers). Properly sized bobbins for your machine. (See owner's manual for size). Owner's manual for your machine so we might troubleshoot if the need arises. Pair of sharp scissors labeled with your name. (Sharp scissors are those that haven't been in the "junk drawer", but rather purposed for cutting fabric only). Two spools of thread - any color. 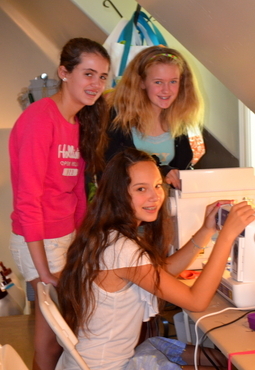 Depending on skill level, a pattern, fabric and zipper will be needed for our more advanced students. This will be determined on an individual basis and we will advise as needed. Self-esteem earned by your child!